Apologies for missing last week’s update. As Palestine Peace & Solidarity has been busier than usual, I was unable to offer an update last week. By way of making up for this, this week I want to focus on some achievements made by the solidarity movement after a quick review of PPS’ recent actions. Hyundai Flash Mob (April 12): PPS activists and friends gathered in front of Hyundai Heavy Industries’ main building in Jongno and in locations in Gwanghwamun, downtown Seoul, on April 12 to call on the company to make a commitment to end all sales of its products for use by Israel to carry out illegal activities in the occupied Palestinian territories. We were met by a representative of the company who agreed to pass on our complaint and get back to us. We are still waiting on their reply and have promised to return in the future if no such commitment is made. You can read our statement on Hyundai here and see a video of our action below. GDAMS (April 15): April 15 was the Global Day of Action on Military Spending (GDAMS) and PPS teamed up with 23 other anti-war/peace groups and other civil society organizations to demand that both Koreas put down their arms for peace. A promotional video was made which won the Craziest GDAMS Video award which I hope you will take a few minutes to watch. As the day coincided with the reopening of the National Assembly, a press conference was held in front of the assembly building with members from the different groups as well as 15 parliamentarians in attendance. The full press statement can be read here. In addition, a Korea-Japan Civil Society Joint Statement was endorsed by participating groups and published and activists donned Teletubby costumes and gathered messages of peace from the public throughout the day. It is interesting to see how these larger-than-life creatures can disarm even the most pro-war of pedestrians! The day ended with a talk titled ‘Sorrows of Empire: Confronting U.S. Military Imperialism’ by U.S. Veterans for Peace activist Dud Hendrick at which he discussed the impact of the U.S. empire of bases around the world. We encourage you to join the photo petition by taking a photo of yourself calling for peace on the Korean peninsula and uploading it here onto the GDAMS Tumblr page. 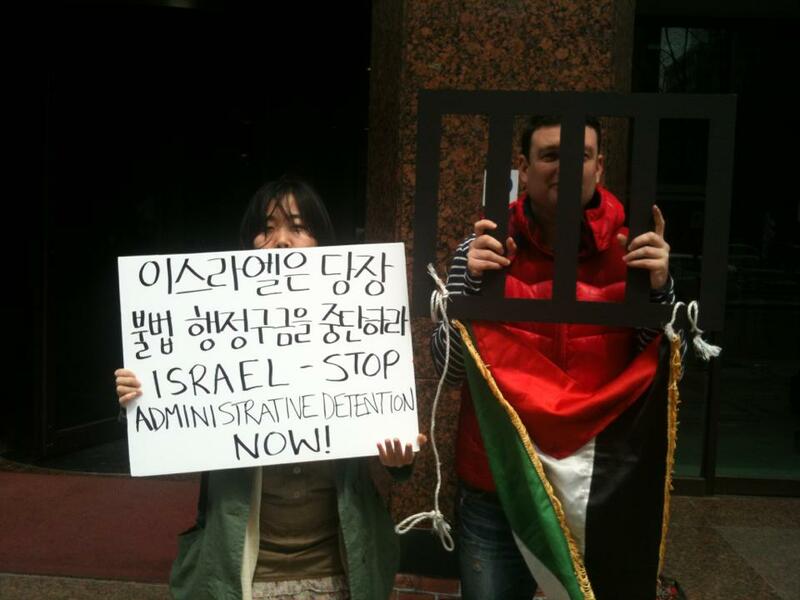 Palestinian Prisoners’ Day (April 17): PPS prepared a street action a day before the official day, on April 16, in front of the Israeli Embassy in downtown Seoul. Focusing on the practice administrative detention widely employed by Israel on Palestinians including many children, we handed out a bilingual information leaflet from Addameer and demanded an end to this cruel practice. You can read our short report on administrative detention here. The Palestine Center for Human Rights reports that during the week of April 11 – 17 the Israeli Defense Forces (IDF) made a total of 71 incursions into the occupied West Bank in which four civilians (including two children) were wounded. A Palestinian shepherd was also shot and wounded by the IDF in the Gaza Strip and fisherman continued to be shot at by Israeli forces imposing the 3-nautical mile limit off Gaza’s western coast. 40 Palestinians were arrested in the West Bank, seven of whom were children. Palestinian Tent Villages: A new form of protest is gaining popularity in Palestine in which Palestinians are establishing what are referred to as ‘tent villages’ throughout the occupied West Bank in opposition to the development of new illegal, Jewish-only Israeli settlements. In a sense, the use of tents to form villages can be seen as an inversion of the illegal Israeli appropriation of Palestinian land. While not a completely new tactic, the recent use of tent villages as a protest space for Palestinians and international activists supporting their struggle began in January and gained momentum during President Obama’s recent visit. The aim is to build a national movement to occupy land from which Palestinians have been dispossessed. Boycott, Divestment and Sanctions: Momentum appears to be increasing in the U.S. for the BDS campaign. The Student Senate at the University of California – Berkeley debated through the night of April 17 and into the morning of April 18, finally passing a resolution to divest from companies profiting from the Israeli military occupation of Palestinian territories in the West Bank and Gaza. In addition, the Association for Asian American Studies (AAAS) recently adopted a resolution in support of the boycott of Israeli academic institutions at its annual meeting. The US Campaign for the Academic & Cultural Boycott of Israel is stating that it is the first U.S. academic organization to boycott Israeli institutions. In another success for the BDS movement possibly driven by the concerted effort of Palestine-based Addameer and other Palestinian prisoner support organizatons, G4S, the world’s largest security company in the world has signaled that it will end some of its contracts with Israel. The company currently operates in 125 countries hand has supplies security systems to all of the major Israeli prisons and detention centers where Palestinians are detained. The company claims it will end its contracts which provide security systems for Israeli military checkpoints, one prison and a police station in the occupied West Bank, but will continue to service prisons inside Israel where thousands of Palestinians are held. Refuseniks: the courage to say No! : 19-year-old Israeli Natan Blanc is the latest brave Israeli to face jail time as a conscientious objector after refusing to serve in the Israeli military in opposition to its brutal occupation of Palestinian territory. He has already racked up 120 days in prison but refuses to abide by anything but his conscience. Other refuseniks, as they are known in Israel, include the nephew of current Israeli President Benjamin Netanyahu, Bibi Netanyahu who views Israel as an apartheid state. Below is a short interview with Natan which is quite inspiring. Israel: End Administrative Detention Now!